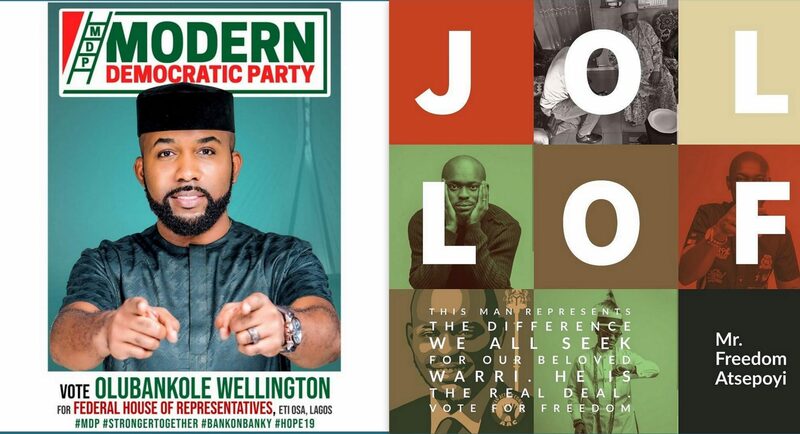 In trying to connect with voters, “Fixing our communities one at a time” was Olubankole Wellington’s motif during his just-concluded campaign. Popularly known as Banky W, artist, entertainment entrepreneur and actor, Mr. Wellington’s bid to become the Representative for Eti-Osa federal constituency at the National lower legislative house was audacious to say the least. Announced three months to the polls, on a nascent political party, Modern Democratic Party (MDP), Mr. Wellington’s work was cut out for him. While he eventually didn’t win last Saturday’s polls, Mr. Wellington’s sentiment clearly struck a chord amongst a substantial portion of voters, winning a handful of polling units over more established parties. Seeing as he was able to pull respectable numbers in a short amount of time, his bid indicates the possibility of future wins for candidates running on the platform of less popular political parties at lesser government levels. As a familiar face to many Nigerians, including voters of his constituency, an obvious factor in Mr. Wellington’s run is his status as one of Nigeria’s foremost entertainers of last decade. While his party of choice was new to everyone, his candidacy was recognisable because he was recognisable. For social currency, his involvement in the 2012 nationwide protest, Occupy Naija, widespread anecdotes of his sanguine personality, and his philanthropic efforts via scholarships and donations to foundations gave him a public track record. So we had a payroll of over 300 people for elections last Friday.. agents, monitors, welfare reps had to be fed, housed and paid. We had RAC centers all over Eti-Osa. We even bought over 300 mattresses so none of the young ppl working for us would sleep in an uncomfortable position. …And then they postponed the elections. Honestly d ting pained me in my chest 😔😭🙆🏽‍♂️. Aside from the mattresses, we need to do EVERYthing all over again on Friday. Feeding, housing, paying fees, renting buses, etc. We even have to order more billboards and campaign material. At every point of need, God has come through. The community has been behind us… Most of our donors have given less than N100K. God bless everyone who has donated and volunteered for our movement.. we wouldn't have made it this far without you. If you haven't donated yet or you don't mind doing it again, this would be a GREAT time to help us out. Pls Help us finish this campaign strong, by chipping in whatever you can. Nothing is too small. God bless you, and thanks for the support. PS there's a GoFundMe page in my profile for ppl in "the abroad". Thanks fam. Building on his perception as a responsible member of society, Mr. Wellington ran an issue-based campaign funded with independent resources and public donations. In this part of the world where elections are deeply intertwined with patronage and party affiliations, rather than the issues themselves, Mr. Wellington’s chosen approach was always going to take more than a three-month headstart. He was contending with eligible non-voters, who aren’t as naive as they are unwilling, often due to lack of trust in candidates, and average Nigerian voters, who are most familiar with ubiquitous political but increasingly savvy at recognising and voting for a genuinely appealing candidate. Since the 2015 presidential polls, where the opposition party’s win was a fair reflection of the electoral consensus, there’s been a slow but noticeable shift in voting culture. Over the course of this election period, civil societies, and public figures, and the corporate society encouraged Nigerians to get their PVCs and participate at the polls, looking at elections as a feasible means of triggering change. At the just concluded round of elections, noteworthy highlights included opposition wins against incumbents Governors running for Upper and Lower House seats in Oyo, Gombe and Akwa Ibom states. Results like these aren’t necessarily trends, but they signal an increased awareness in the Nigerian democratic process and the importance of candidate individuality, either for or against. Also, since candidates the prominent political parties contesting for lower level seats, usually have a chasm, borne of anonymity, between them and the voting public, the allure and chances of candidates like Mr. Wellington, who has an affable public profile, increases significantly. It’s no news that the numerous third force parties stand little chances against the ruling and opposition parties, meaning candidates running on those pseudo-anonymous platforms are even more obscure. For Mr. Wellington, though, the familiarity of celebrity assisted in emboldening perception of a personable candidate, whom voters could connect to without the baggage that comes with running a popular party. Similarly, coining in on the familiarity that comes with being a public figure, Freedom Atsepoyi contested for the Warri federal constituency seat, as the candidate for the African Action Congress (AAC). Popularly known as Mr. Jollof, a popular comedian and the attributed originator of the popular phrase, “everything stew”, Mr. Atsepoyi eventually resigned off the race on election day, due to inner-party conflict. Although running on a largely unknown party, Mr. Atsepoyi’s candidacy was recognisable because he was recognisable. With a follower count of 363, 000 on Instagram, and posts with co-signs from celebrities, he had a formidable online presence that knew of, and could track his campaign, even if a significant portion of those followers couldn’t vote for him due to location. By INEC’s count of the final votes for the presidential elections, candidates from both APC and PDP, Nigeria’s strongest political parties had a combined 25million votes of the roughly 29 million total votes cast. Although wholesome on the surface, there were concerns for example about Mr. Wellington’s campaign strategy being “elitist”, meaning the middle-class folks whom he appealed to almost immediately, are notoriously apathetic during elections. But his attempt like many other independent candidates translates to a potential for a somewhat optimistic future for Nigerian politics. Expectations from future candidacies will also go beyond the traditional celebrity scope. Public individuals who have built up relevant reputations over time will have social media as a documentation tool for a valid track record. This is where they will have to do more in assuring potential voters with a public record that serves as a marker of good faith. Such public profiles will lay down good precedent that can inspire hope amongst apathetic and unsure voters alike. On Burna Boy’s latest single, “Dangote” the singer muses that Aliko Dangote, Africa’s richest man is still trying to amass more wealth. Elsewhere on the track, Burna’s excellent gaze of the what it means to be Nigerian in 2019 emerges when he quips on his own constant grind as if it would be unreasonable for him to do anything less. As far as Nigeria’s democratic process is concerned, votes and voters will continue to show up because, as Burna says, If ‘Dangote still dey find money’, then those who have nothing will need to take charge of their own destiny. As long as the process of fixing the country one community at a time is given equal parts scepticism and patience to succeed, extensive people-oriented politicians will continue to emerge, and public opinion will continue to tilt towards a politically aware polity.